Last week I attended the awards night for the wrap-up of the Nature Conservation Council of NSW‘s Illawarra Climate Challenge (remember my post when it launched?). 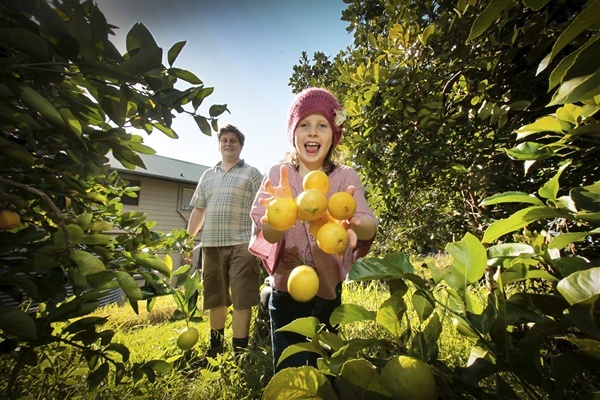 Overall, a little over 300 households across the Illawarra registered for the challenge. Those who earned over 35 stars in the scoring system in the Challenge booklet were dubbed “climate champions” and were eligible for prizes at the awards night. In keeping with my run of great luck lately, I won the major prize! I received a $300 voucher from Bike Hub, a local bicycle retailer. My eldest daughter has Down syndrome; we’re planning to put that money towards getting her a 3-wheeled bicycle so she can keep up with her sisters at the park. All the climate champions were also given a fruit tree. Here’s the NCC press release covering the Challenge wrap-up. Nice one Darren. Congratulations on a well deserved win! Congratulations Darren & family! I hope that you continue to blog – your posts are always so well researched & informative! Way to go, Darren! I love the photo. congrats on your win, fantastic news! Couldn’t think of anyone else more deserving, you and your family are such an inspiration for sustainable living! Hope your daughter is enjoying her bike! @Happyearth: Thanks guys! I haven’t had a chance to get to the bike shop yet to work out what kind of bike to get for Grace. I’m thinking either a three-wheeler, or one of those frames that bolts on behind a normal bike so we can ride together. I’ll post something when I figure it out!